Berties Elland, was where we headed for our first wedding of 2017 – and we do love the challenge of a city centre wedding! We have to get a little more creative than normal. Usually there are no gardens to use for the shots of the bride and groom (Gemma & David in this case!). Not to mention the added stress of finding parking (and change for parking!). Then of course there is the general public just wandering around! We love it! Our last wedding of 2016 was by far the coldest we’ve ever done, -4 and literally 5 hours of daylight! It was a bit of a shock to the system when we woke up on April 8th to discover a bizarrely warm day in the making, not to mention a bright blue sky without a single cloud to be seen over Elland Halifax!… great for weddings, but not ideal for photographers… shadows and squatting, you get the idea! We’d met David & Gemma 2 years ago, and they helped me with a lighting test shot of them stood at the alter, shortly before the ACTUAL groom arrived – so it was great to see them standing their themselves on their own wedding day. 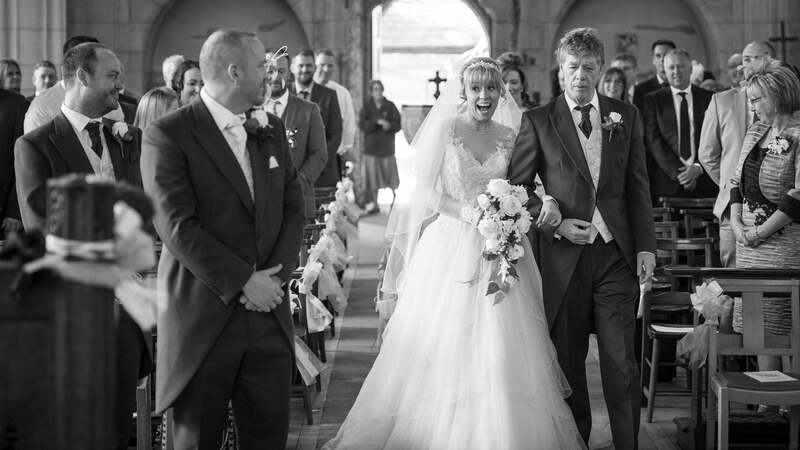 Church, Groom, guests on a bus, a retiring Vicar who was awesome, Bride, Ceremony – done! On to Elland Halifax, and to Bertie’s and the smiles, drinking and laughter continued… as you’d expect! For other venues to the west of Leeds, you might want to check out Oakwood Hall also!